Being a proud Singaporean, I'm always excited for our yearly National Day Parade because that is the day I get to see Singaporeans from all walks of life come together and celebrate Singapore's birthday – united and in harmony. With last year's SG50 NDP being a huge success, I'm sure like many of you – I look forward to SG51, the next chapter post SG50! Recently, I attended the NDP 2016 media event where the theme, concept, and logo of this year's National Day Parade was unveiled by the Chairman of the NDP 2016, Brigadier-General Kenneth Liow, who also shared with us what are the new elements that we can expect in NDP 2016 and more. The theme for this year's National Day Parade is "Building Our Singapore of Tomorrow" – where 'Building' demonstrates that nation-building is a continuous effort and that the journey towards our future can be realised with hard work and continuous endeavour. 'Our Singapore' invokes a sense of belonging in Singaporeans, and 'Tomorrow' implies that Singapore is forward looking, representing the start of a new chapter post SG50. NDP 2016 will mark the first NDP for the next 50 years in our journey towards SG100, and to celebrate the significance, it will be held at the iconic National Stadium – where NDP was last held 10 years ago. Recognising the need to move into the future, NDP 2016 will be leveraging on technologies to present a refreshed NDP experience – where new displays such as 3D projection displays, aerial displays involving performers and props will be complementing the traditional displays. I'm really excited for the aerial displays by the performers and most importantly – indoor fireworks! I am unsure how it is going to work but indoor fireworks sound really fantastic! 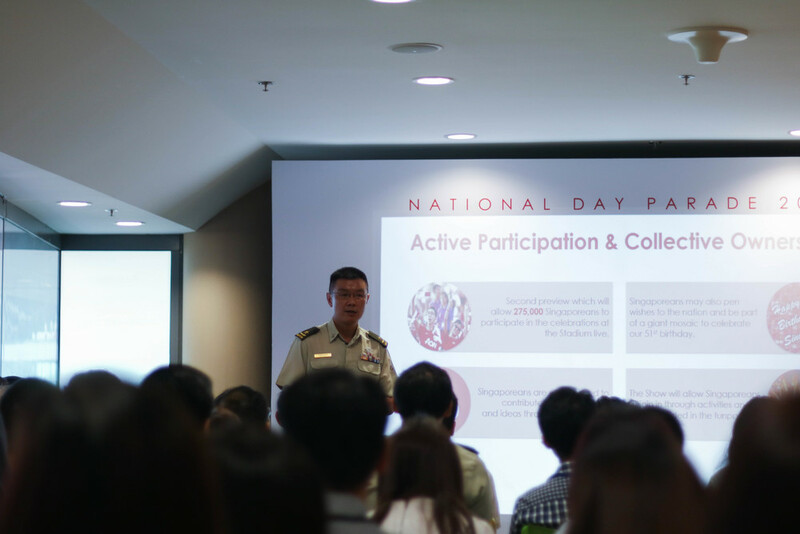 As NDP 2016 seeks to encourage active participation and promote inclusiveness among Singaporeans, there will be introduction of initiatives such as opening a second 'NDP Preview' session for Singaporeans to attend the celebrations 'live'; encouraging Singaporeans to contribute actively to NDP 2016 via social media platforms, as well as involving the audience through activities during the parade. Since NDP 2016 seeks to encourage collective participation from Singaporeans, a logo competition was held and opened up to all Singaporeans for the design of the NDP 2016 logo. Here's a picture of the winner, Ms Chelsea Lim from Singapore Polytechnic, along with one of the NDP 2016 Logo Competition Judges, Mr Dennis Mark. As shared by Chelsea, the designer of NDP 2016's logo, this logo reminds Singaporeans of our love for our nation, and to be thankful for the people who have contributed to making Singapore what it is today. The four different shades of red represents the diverse races and religions in Singapore and how everyone lives together in harmony, while the hand-written font represents that our future is ours to write and build together. Ending off this post with a photo of ourselves with Brigadier-General Kenneth Liow. Really excited for what's to come this NDP 2016!